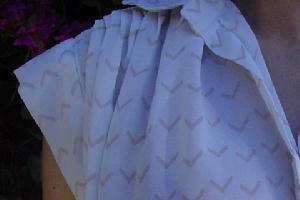 This French sleeve blouse was made at Siam Square in Bangkok. The tag says it's a size M, but it fits like a size 8/10 (or smaller). 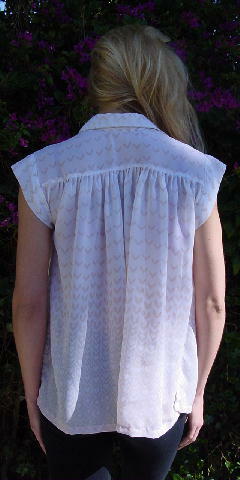 It has a sheer white fabric (content unknown) with a V design in cocoa-peach. 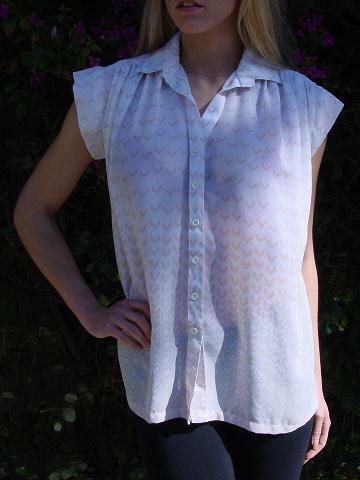 There are 6 white buttons down the front and mini pleats in the front and back extending downward from the yoke, which give it fullness and movement. It has a 4" semi V neck opening. There are two 7 1/2" side seam slits. It's from a Miami model, who wore it at the beginning of her pregnancy. She loved that it was lightweight and allowed for extra room around her middle. shoulder to end of sleeve 2 1/4"